Celebrated as one of the most enchanting natural phenomena on the planet, the Northern Lights are a must see for any well-seasoned traveller. Also referred to as Aurora Borealis, the spectacular natural light display sees the northern skies light up with a spectrum of colours. While the event is nothing short of magical, the Northern Lights have a logical scientific explanation. When solar wind and magnetospheric charged particles collie in high altitude atmospheres, the result is the expansion of the auroral oval. This then sends streams of eerily beautiful reds, greens, yellows, pinks and blues dancing across the sky. The Northern Lights can be shy and won’t always make an appearance, but you can improve your chances of seeing them. If you want to experience Aurora Borealis for yourself, we’ve put together this handpicked selection of cruises that will give you the best chance of marveling at the natural wonder. Renowned as one of the finest boutique cruise companies in the business, Celebrity is a fantastic for those determined to see the Northern Lights in style. The 17 night Rocky Mountaineer & Alaska Cruise adventure departs on May 11 2015, serviced by the 2158 passenger Celebrity Millennium. Cruising out of the cosmopolitan Canadian city of Vancouver, the luxury liner will make a beeline for the snow-capped peaks and dramatic ice shelves of Alaska. Here, passengers will be awestruck by breaching humpbacks, soaring eagles and other native Alaskan wildlife. Traversing the famed Inside Passage is the perfect opportunity to spot sea lions while the picturesque fishing village of Sitka offers an authentic taste of traditional culture and customs. Sailing on the MS Oosterdam, this incredible cruise pulls out of Vancouver on May 9 2015. After one night soaking up the atmosphere of Canada’s coastal seaport city, passengers will be treated to the breath-taking natural beauty of the Inside Passage. The charming Alaskan city of Ketchikan features some fascinating museums and historical monuments while the capital city of Juneau is dominated by the magnificent Mendenhall Glacier. From an adventurous day spent husky sledding and kayaking to a more relaxing itinerary of whale watching and shopping, there is something for everyone! Of course, one of the undisputed highlights of the trip is a call at Skagway, the ideal place to see the glorious Northern Lights. Departing on May 18 2015, this 13 night cruise on-board Jewel of the Seas is sure to sell out well in advance! The experience kicks off in Calgary, where passengers will be whisked away on an unforgettable Summit Helicopter Tour over the rugged landscape of the Rockies. After a night in Banff, guests will jump on-board the famous Rocky Mountaineer for an incredible train journey featuring snow-capped peaks, dramatic mountain passes, impressive tunnels and tranquil lakes. The journey ends in Vancouver, where guests will spend one night exploring the city before boarding the luxurious Jewel of the Seas. The Inside Passage is a fantastic opportunity to spot native Alaskan wildlife such as killer whales, sea lions, porpoises, eagles and bears. When the forecast is favourable, the historical gold rush town of Skagway is a prime place to gaze at the Northern Lights while enjoying life in a traditional Alaskan settlement. If you’re on the search for a last minute Northern Lights expedition, this 23 night Norwegian Star voyage pulls out of Copenhagen on September 13 2014. After stops in Berlin, Tallinn and St Petersburg, the Dawn-class cruise ship will set her sights on the chic Finnish capital of Helsinki. A trip to Stockholm is the ideal opportunity to soak up some Scandinavian history and culture while the charming Norwegian town of Bergen is famed for its colourful wooden houses and dramatic mountain scenery. As well as being home to trendy cafes and boutique shopping, Iceland’s Reykjavik is also a great place to spot the mesmerising Northern Lights. The journey wraps up with day trips to the Scottish city of Glasgow and Ireland’s lively capital, Dublin. Why not take the opportunity to sample some tasty haggis or sip an authentic pint of Guinness? Departing from the German port of Kiel on July 11, this 15 night cruise is an intriguing blend of cosmopolitan culture and natural wonders. The majestic Queen Elizabeth makes her first call in the pretty town of Bruges before setting her sights on Cunard’s home port of Southampton. Calls at Dublin and Belfast offer passengers the chance to revel in a spot of authentic Irish merrymaking before sailing into the Icelandic port of Reykjavik. In this itinerary, the northern town of Akureyri is the best place to keep an eye out for the incredible Aurora Borealis. 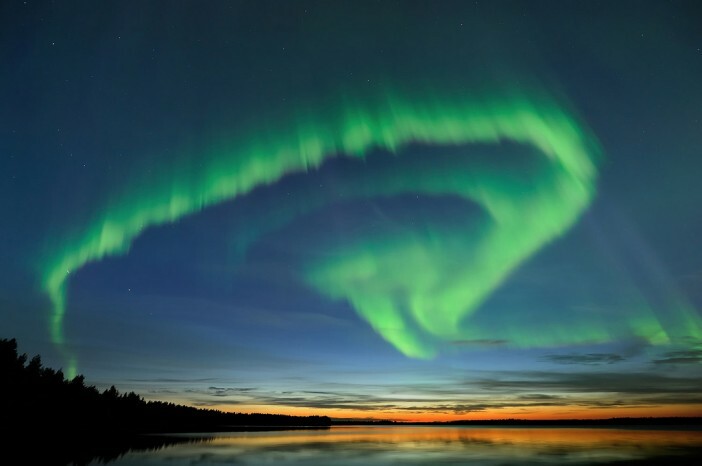 For incredible deals on the above cruises as well as a huge range of alternative Northern Lights themed itineraries, the experts at Cruise 1st have you covered! For more information about any of these cruises, call us today on 1300-857-345. Images sourced via Flickr Creative Commons. Credit:Visit Finland.